Trust us, we get it: washing up isn’t the most exciting thing in the world, and spending your hard-earned cash on accessories for this dullest of drudgeries can seem particularly unfair. But when we do it every day (or every other day, or, er, once a fortnight) it can be easy to forget how important it really is — and that’s very important indeed. You might not think that a dish rack or drainer is something that needs too much consideration, but as homeware enthusiasts, we’re not afraid to tell you that you’d be way, way off, and our list of the best draining racks is here to back us up. Whether you have what feels like the world’s smallest sink and no worktop space to speak of, or you handle heavy loads for a big household, our pick of the most devilishly clever draining racks on the market has a solution. Added tiers for extra storage without the bigger footprint, foldaway racks and levels to stay out of sight when not needed, and handled designs you can tote from sink to cupboard and back again. It’s not just storage solutions these little drainers go big on though: with flexible rods for keeping cups and glasses in place, microfibre mats for drying delicates, and spouts to drain off the excess water, they all do their bit to make after-dinner clean-up a little less of a chore. This Joseph Joseph drainer looks great, its adjustable surfaces compact for storage, and the new and improved, widely-spaced spike design can hold whatever you throw at it, including tricky-shaped glasses and bulky mugs which would baffle a wire dish rack. Cleverly, the integrated spout will drain away excess water so you won’t be left with a stagnant puddle, and the included cutlery holder can fit anywhere on the rack. This compact dish rack from simplehuman is our best pick for small kitchens, with its space-saving ability to sit in the sink when not in use, or on the worktop to let the draining spout work its magic. This durable dish-drainer is also rustproof, corrosion-resistant and, especially with its removable wire frame, easy to clean. A winner for diminutive diners. This foldaway dish rack from trusted brand OXO is excellent for kitchens with no worktop space — when it’s cleared, it folds in on itself to slide easily into the cupboard, but it’s great when in use too. I has a mixture of plate racks and cup tines, so you don’t even have to think about what’s going where, a godsend when you just want to sit down in the evening. The solid bottom means it won’t drip on the worktop, but beware of gathering puddles. If you need extra drying space after a dinner party or big family meal, or just want something that’ll be sure not to scratch your delicate dishes or stemware, consider these absorbent drying mats from the geniuses at Lakeland. Unlike a tea towel, water won’t leak through, leaving the lips of your cups and glasses sitting on a damp surface, and unlike a metal dish drainer, it’s kind of scratchable surfaces. Not an all-round solution, but a really helpful add-on for large loads and extra-dainty glassware. Like simplehuman’s compact drainer, the Umbra Tub Dish Drying Rack sits happily either in the sink or the worktop, making it great for small kitchens. But if you’re happy to spend the extra £5 for the latter, you’ll find a few more tricks up its sleeve, like easy-carry handles for transporting dried utensils and flatware to their cupboards and drawers, and a choice of standout or subtle colours to suit all kinds of kitchens. This two-tier plate rack cleverly bumps up the storage without taking up any more worktop space by going vertical. 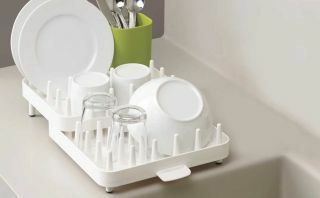 While it’s styled after the traditional wire dish rack, there are clever additions that bring it back up to date, like a drip tray to save constant wiping, a sturdy upper shelf that’s stable enough to hold plates firm, and an included cutlery holder. Not sold on the design? Joseph Joseph’s adjustable rack is a good design-conscious alternative. No, you’re not seeing things — this HOME by Argos offering is a dead ringer for the Joseph Joseph drainer at number one, and for less than half the price, making it our best budget drainer with all the good looks of the branded version. You can remove the cutlery and cup holders to make a ridged drainer perfect for drying pans, and the spout drains water directly into the sink to prevent limescale build-up and mildew. Once you have picked your perfect dish rack, start getting creative in the kitchen with one of our picks of the best soup makers 2017.